In fact, it has been long since I wrote for you last time and lots of things happened in the meantime. In my latest post I told you that I was planning to go in Washington for another conference. This was the Transportation Research Board (TRB) Annual Meeting that this year celebrated its 97th edition and represents probably the biggest event for engineers and professionals in transportation at international level. Just imagine that this year they received around 6000 papers and for a conference this is just huge. They also have their own journal that publishes only the best papers submitted to the conference. Figure 1 – The White House, home of the president of the USA, and symbol of the USA. Unfortunately, this year my paper did not manage to be published in the journal of the TRB but I was honoured to be able to present part of my research in the poster session dedicated to “Truck Efficiency: Routing, Platooning, Energy Consumption, and Safety” on the very first day of the event. Of course guys, it is in my plan to be able to publish in that journal in the future. It is an achievement for any researcher in transportation and hard work always pays off. You know, presenting in a poster session does not seem cool, right? However, I have to admit that a poster session in a huge conference like TRB is just perfect. You have an hour to explain to people that come literally from everywhere and ask you questions on your research and findings. You have the possibility of receiving feedbacks, ideas, and share experience with some of the most important experts in the field. Also, this is a great opportunity for networking and exchange business cards (you never know what the future reserves to us). Figure 2 – View on the area dedicated to the poster sessions. Figure 3 – Me presenting at the poster session. Also, my supervisor Tony presented (on invitation) part of my research work at the ISAP Day a special session organised by the International Society of Asphalt Pavements (ISAP) and that focused on “Impacts of Asphalt Pavement Condition on Vehicle Fuel Efficiencies”. And I was really glad to see other researchers asking questions and show interest for the work that we have done. As I already mentioned, several researchers, engineers, and professors in the field were at the TRB. I saw a few friends that I met at the ROSE workshop in Copenhagen. I met, Prof. Karim Chatti (that I met for the first time at the RILEM conference in Nantes) who wrote some of the most complete report on the impact of road unevenness and macrotexture on vehicle fuel economy in the US. And, I met Ulf Sandberg, for the very first time, who is Senior Research Scientist at the VTI, the Swedish Road Directorate and who is author or co-author of about 20% of the papers in my literature review. A true pioneer of the topic of rolling resistance and its impact on vehicle fuel consumption. And you know what made me really proud of my work? It was the fact that these scientists asked me questions, gave me feedbacks, and shared with me their experience. I was honoured to see their interest in my work and this represents for me one more motivation to work hard every day. Of course crew, if you would like to read what I am working on at the moment and what results of my research are, please, visit my Research Gate profile (here) and you can find information on that. 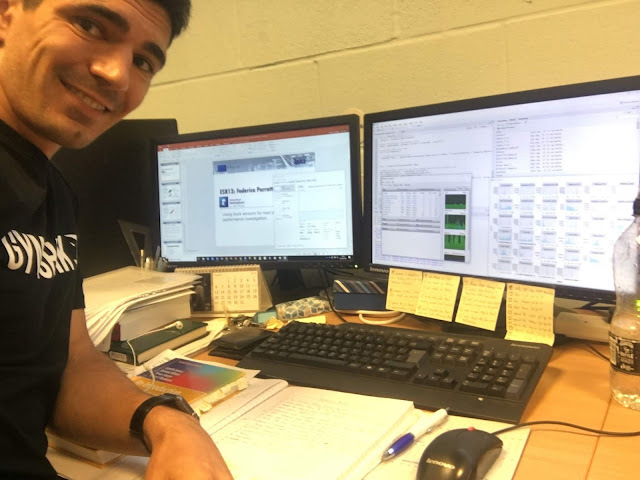 Also, if you have questions regarding my job, or towards results of my research, or perhaps, you are just curious of knowing more how life is at the University of Nottingham, please, do not hesitate to drop me an e-mail at: perrottafederico2@gmail.com. How was Washington? Yes, of course I was forgetting to tell you about that. Well, you know, although the travel is so long and the weather cold, I must admit that the city itself is nice. However, you may be disappointed from the fact that you will not find skyscrapers around the city centre (that you expect as a must in the USA). Washington has been built to be the symbol of the States. Roads are the largest that I have ever seen, buildings are massive, and the most common cars are SUVs. It is just majestic. Figure 4 – View of the United States Capitol, legendary home of the United States Congress. You can see that the pool in front of it was frozen! It was impressive and I must admit that I would spend a holiday there and take my time to visit places in the area. It was literally a pity that my travel there lasted for just a week and I couldn’t sightseeing much, but you know, that’s business and I couldn’t stay more. Imagine that I did not have even the time to come back to Nottingham that I was on a flight for Dublin for attending a meeting and training week with the TRUSS ITN project. But this is another story and I will tell you more about it in a following post. At the moment, I am in the process of reviewing one of the journal paper that we submitted and I wrote two papers for attending the IALLCE 2018 conference that will be held in Ghent (Belgium) in October 2018. Also, I am in the process of collecting new data so that I will be fin ally able to test my methodology on a larger dataset. As you can imagine, things are becoming more and more interesting with lots of work still to do and fewer and fewer time remaining to the end of this fantastic path that is the MSCA fellowship and PhD. As always it was my pleasure to share my experience with you crew. I hope you enjoyed as well this post and please do not stop to follow my blog and support me. I’ll keep you updated! Have a great and productive day crew!